If you are looking to widen the scope of religious powers, this may help. Publisher's blurb: "The Class Acts PDFs introduce new class options for the base classes and core classes featured in the Pathfinder Roleplaying Game. Every PDF contains two full pages of high quality content (no fluff or filler)! 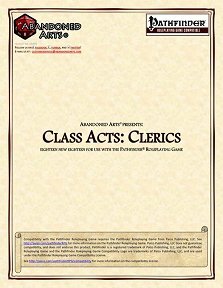 "Class Acts: Clerics includes eighteen full new subdomains."